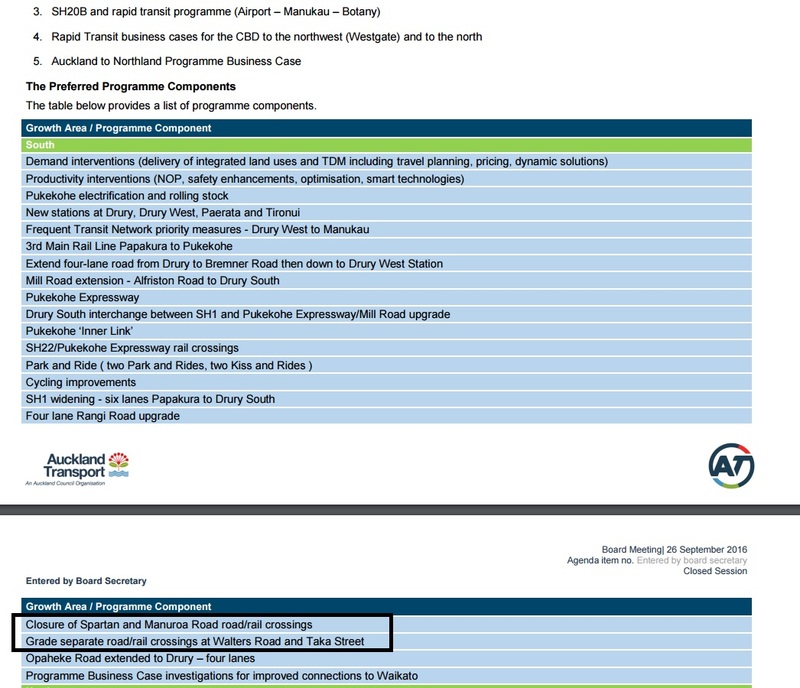 I have blogged in the past that the Transport for Future Urban Growth (TFUG) had a lot to be desired from both Auckland Transport and NZTA. It was a roads first and transit last feast with what little transit improvements available still missing the mark quite badly (like busses rather than rail to Manukau City Centre). The closure of Manuroa Road level crossing! While grade separation of level crossings on the Southern (rail) Line is needed as the amount of passenger and freight trains increase (especially when the Third Main is built) I question Auckland Transport’s logic in closing Manuroa Road when it is a main access for trucks between the Southern Motorway and the Takanini industrial complex. 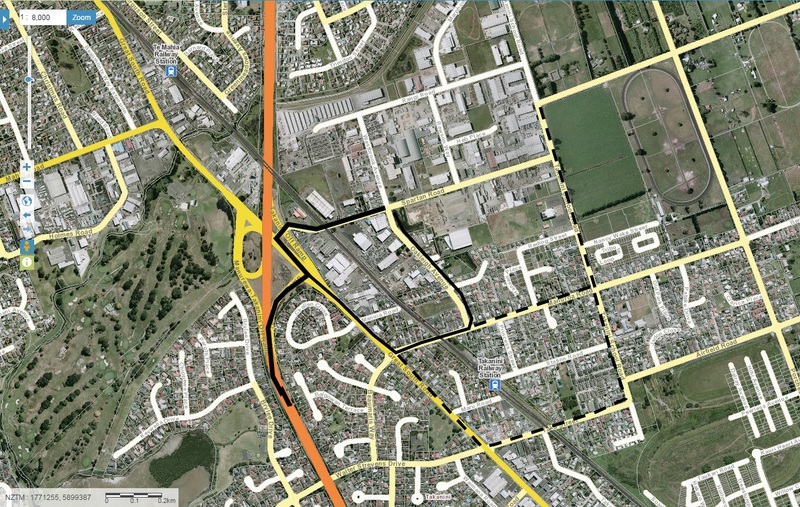 The solid black lines are the current access points which take the trucks over Manuroa Road level crossing especially if they (the trucks) are coming from the north. If Manuroa Road level crossing is closed rather than grade separated the dashed line becomes the new route for trucks wanting to access either the motorway or the industrial complex. The new route will bring the big H-class 55 tonne trucks down Takanini School Road, through the dangerous Manuroa/Takanini School Road intersection, past the Takanini School and down the narrow Taka Street area that has a motel that is often full (cars on the road parked). Effectively closing Manuroa Road rather than grade separating it will bring both general and freight traffic down residential roads to Taka Street in trying to access the motorway and Great South Road. I do not think that is either wise nor safe given there is a primary school in the area. The best thing to do is for Auckland Transport and NZTA to grade separate Manuroa Road and Taka Street enabling current access as it is now. Spartan Road was always going to be closed as part of the Southern Motorway upgrades. While the Great South Road is due to get bus lanes this year to help the 33 Great South Road frequent bus (every 15 minutes minimum) those bus lanes do not need to be tangled up with trucks from Taka Street because Auckland Transport in a flight of fancy decided to close Manuroa Road. Come on Auckland Transport let’s engage the brain and work out why it is a bad idea to bring 55 tonne trucks down Takanini School Road and Taka Street. This is madness. The traffic on Manuroa Road has increased substantially in the last 12 months and when Spartan Road rail crossing closes, it will increase more, not only heavy trucks but all vehicles. Traffic on Taka Street will also increase substantially when the new road from Addison opens, and the new roundabout is not designed for large trucks. Taka street between the rail crossing and Gt South Rd is reduced to one lane during the week because of inadequate parking at Takanini Train Station. Traffic on Gt South Rd between Manuroa Rd and Taka St (and beyond) is often stopped or crawling on week days and this proposal will only make the problem worse. Grade separation at Manuroa Rd, Taka Street, and Walters Rd rail crossings is essential and the best solution for the future. Get into them Ben. This is a bloody silly project. We should be separating heavy commercial and residential traffic, not throwing it all together. And we wonder why cycling and walking to school rates kept dropping. Traffic engineers seem completely blinded to these awful outcomes. Luke just Tweeting now that AT want to send heavy trucks down residential Mahia Road as well. While there is some industry there is is no expansion of that complex so where are they going? Real entertainment watching huge truck and trailer units negotiate the new round-a-bout at Taka Street? I seriously think all of the AT planners don’t know where Papakura/Takanini is?